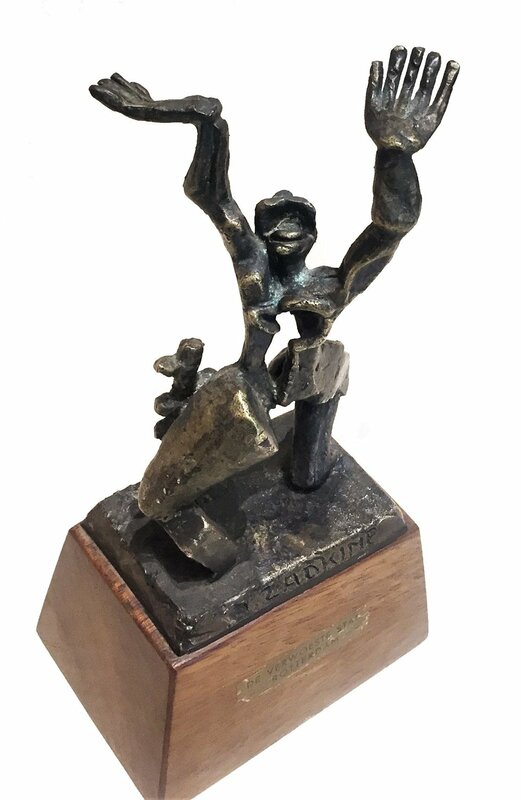 This is a small version (scale 1:60) of the famous sculpture by Ossip Zadkine, The Destroyed City (De Verwoeste Stad) that was established in the center of Rotterdam in 1953 and became one of the most important symbols of the city, attracting thousands of tourists and art lovers from around the world since. According to Zadkine, the idea for The Destroyed City was born when he arrived by train in the devastated city of Rotterdam in 1946. It is, in his own words: ‘A cry of horror against the inhuman brutality of this act of tyranny.’ The sculpture represents a distressed figure with its head and arms lifted skywards. 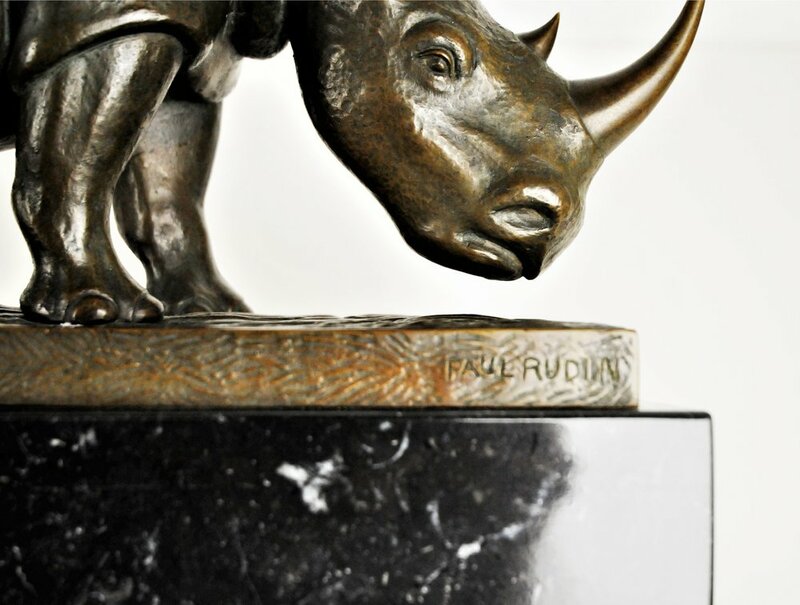 Zadkine has positioned the arms, legs and hands in various directions, giving the sculpture a great dynamism. The figure leans against a tree trunk, providing a balance for the six-meter high colossus. The hole in the figure’s torso symbolizes the destroyed heart of the city during the bombings of 14 May 1940. Zadkine initially made the sculpture as a general memorial for the war rather than as a specific sculpture for Rotterdam. 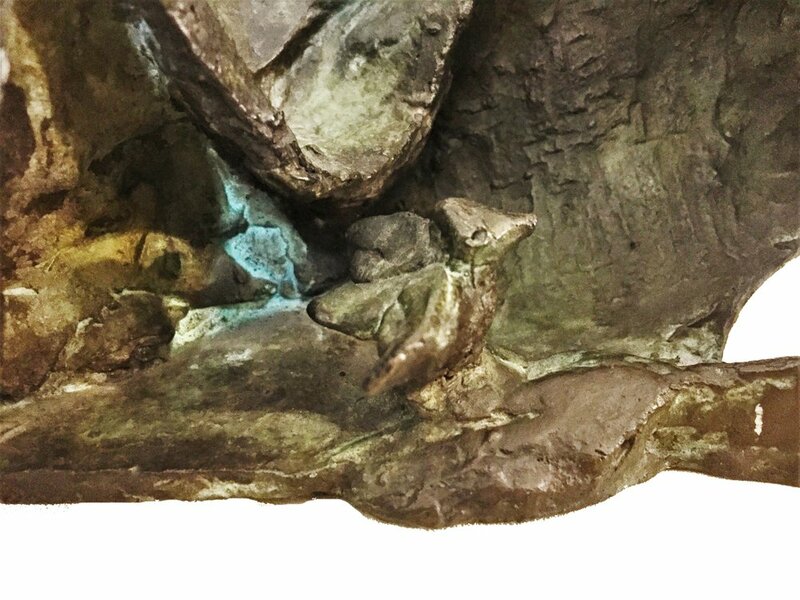 The first model was made of terracotta and was exhibited in Berlin, but was badly damaged during transport. Zadkine then made a new version in plaster that was included in various exhibitions during 1948, including one in Amsterdam. 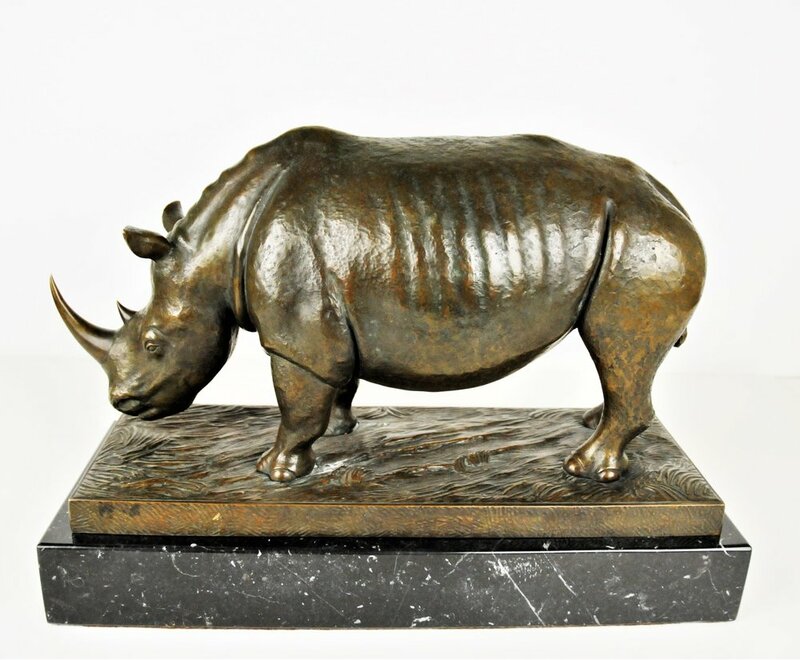 The then director of the De Bijenkorf department store, Mr van der Wal, was impressed by the sculpture and wished to donate an enlarged bronze version to the city of Rotterdam to commemorate the destruction of the city centre. To allow the citizens of Rotterdam to become accustomed to the sculpture, it was presented to the public on two occasions: in 1949, in Museum Boymans; and in 1950, at Rotterdam Ahoy. The sculpture was donated to the city on the condition that Zadkine was allowed to choose the location and that the donor would remain anonymous. The sculpture was unveiled on 15 May 1953 by the mayor, Mr van Walsum. The association between Rotterdam and Zadkine is so strong that in 1990, a Zadkine College (now ROC Zadkine) was inaugurated. There is also a bronze relief of Zadkine on the Müller Pier, made by the Rotterdam sculptor, Willem Verbon. Ossip Zadkine (Russian/French, 1888-1967) was a relentless, unclassifiable and prolific artist. Today, we can count more than 612 sculptures and a large number of works on paper; 765 gouaches and drawings, as well as 200 lithographs and etchings. The exhibition of his works in his Parisian studio of the rue Rousselet on May 20th 1920, marks the beginning of a long series of shows, including more than 105 solo exhibitions during his lifetime - in Europe; but also in the United States and in Japan. 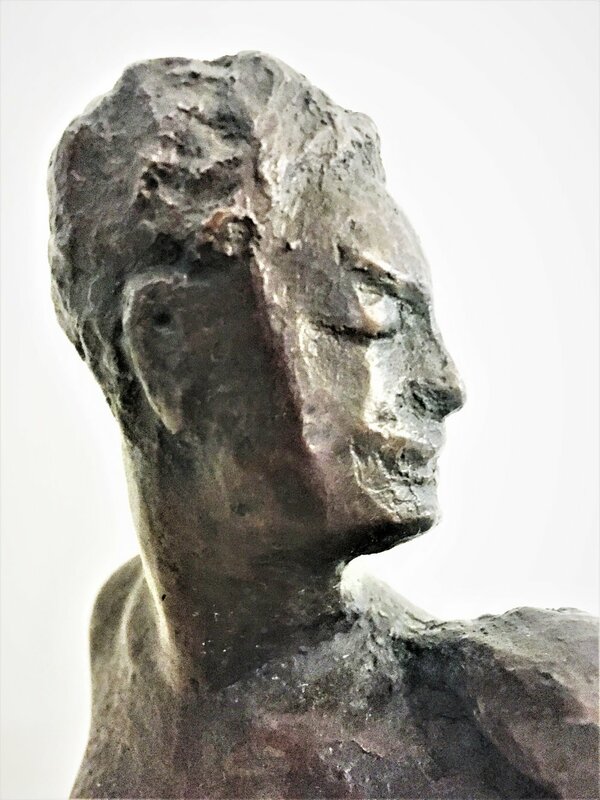 Truly, a man of the world, Zadkine lived in Belarus (in Vitebsk, his birthplace), in England (Sunderland and London), and in France (Paris, Bruniquel, Les Arques). During the First World War, he enlisted voluntarily and was posted to the Russian ambulance corps in Champagne in 1916. During the Second World War, he fled to New York City and lived there from October, 1941 to September, 1945. He also travelled to many places: Belgium, the Netherlands, Greece, Italy, Japan, America, amongst others. Zadkine collaborated with many people on diverse occasions - with architects (Adrien Blomme, Joseph André, Hugh Maaskant), decorators (Marc du Plantier, André Groult), poets (Claude Aveline, Robert Ganzo, Pierre Béarn …); and was close to such important individuals, as artists (Marc Chagall, Henry Moore, Tsuguharu Foujita, Amedeo Modigliani …); thinkers, founders, collectors, doctors, industrialists, businessmen… worldwide. Ossip Zadkine gathered his memoirs in his book, ‘Le Maillet et le Ciseau’, which he started writing in 1962. 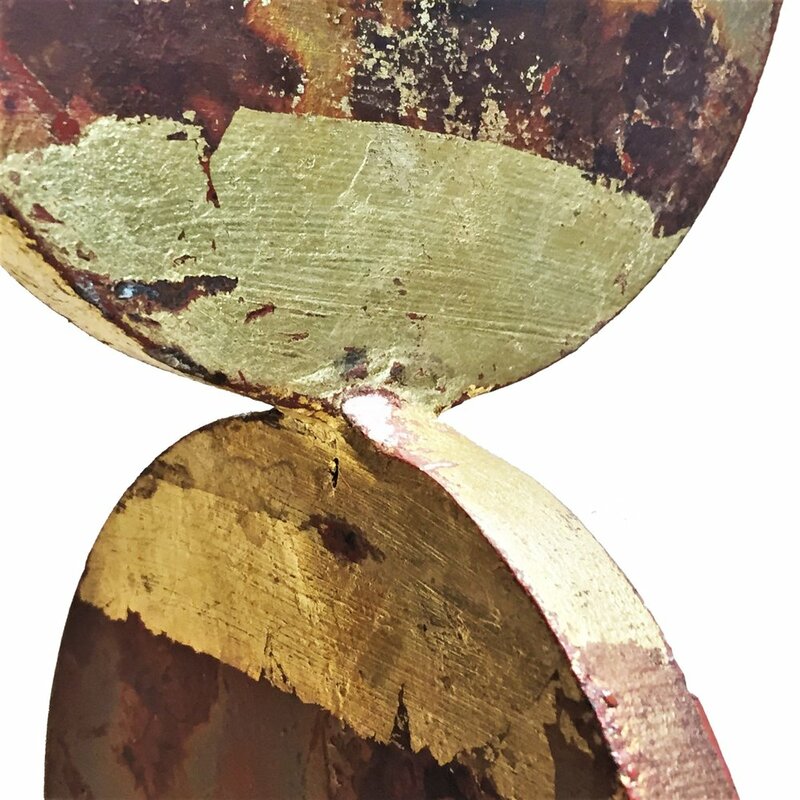 Illegibly signed by the artist on the base, this laconic in form anodized iron sculpture’s rough and brutal surface is further enhanced with only a few segments of circles painted with a real gold paint. A remarkable mobile double-figure sculptural group with both, male and female figures rotating freely around their own axis; and where both figures can be installed in any position relative to each other. With any new desirable position, it becomes apparent how their relationships change diametrically with each and any turn of the figures. 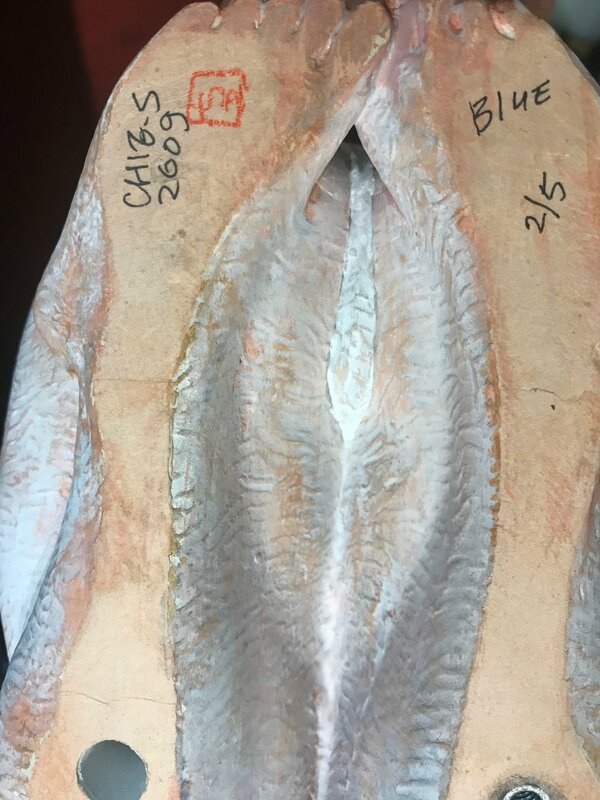 There is also a collector’s hand-written label affixed to the bottom of one of the bases (please refer to photos). Good vintage condition consistent with age and use. We make our best effort to provide a fair and descriptive condition report. Please examine the photos attentively, as they are an integral part of the item description. Send message to this seller to request more details or discuss price. 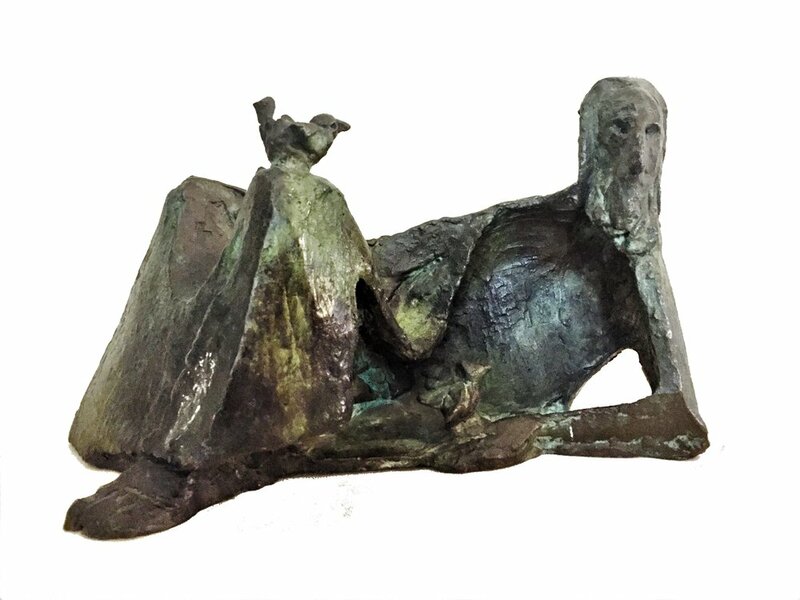 Aurelio Teno Teno a/k/a Aurelio Teno (Spanish, 1927 - 2013) was a Spanish sculptor and painter. He stood out for his interpretations of Don Quixote, as the one who imagines him - mounted on the horse named Clavileño - as the first cosmonaut in history. Between 1936 and 1943, he lived in Córdoba where he trained artistically. First, as an apprentice in the workshop of the sculptor Amadeo Ruiz Olmos; later in a silverware workshop; and since 1939, in the School of Arts and Crafts of Cordoba, where he studied painting and drawing. In 1950, he moved to Madrid to work as a goldsmith; and later to Paris, where he lived for ten years. There, he extended his studies of fine arts, and is strongly influenced by Giacometti and expressionism in whole. 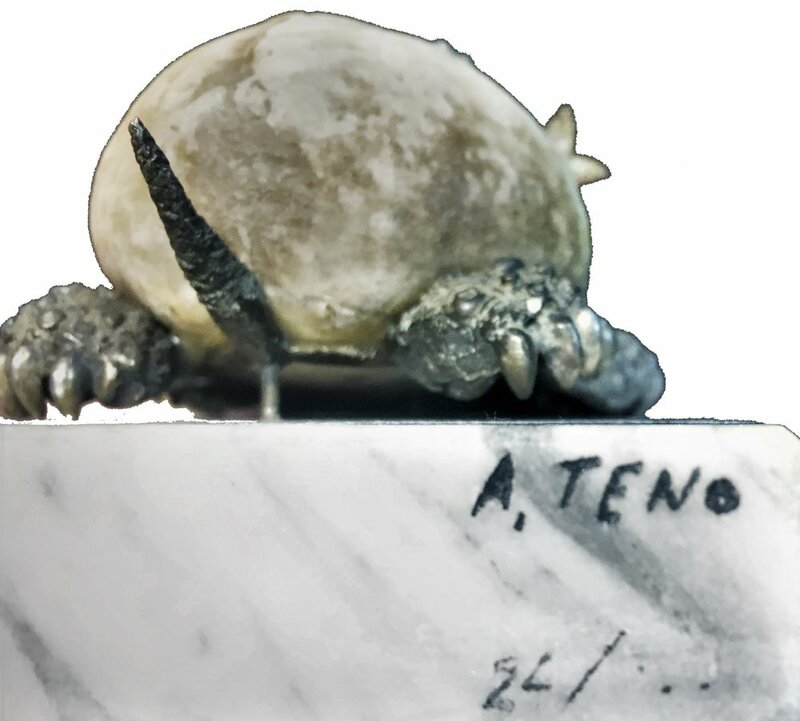 This period in Teno’s artistic life is celebrated by several exhibitions of his paintings in the Salón del Art Libre, Palais des Beaux Arts galleries and others. At the same time, he continued to dedicate a lot of time to the creation of his famous sculptures-jewels. In 1965, he returned to Madrid although he installed his studio in the Molino del Cubo (Ávila), where he researched new plastic procedures and also exhibits his controversial polemical paintings at the Ateneo de Madrid. Begining that year, he starts a series of international exhibitions in Copenhagen, Paris, New York, Rabat and San Luis (Missouri, USA). In 1976 he consolidated his international prestige as a monumental sculptor by winning the contest for Don Quixote sculpture creation, which would rise before the Kennedy Center in Washington D.C., competing with Salvador Dalí and José de Creeft. Finally, he installed his workshop and a museum, dedicated to his work in the old monastery of Pedrique (near Villaharta) in the municipality of Pozoblanco. There is a park that bears the artist's name, as well. The City Council has created a foundation for the preservation of the artistic legacy of Teno. Aurelio Teno died in Cordoba, at age 84. Signed and numbered on base. acques Loutchansky (French, 1876 – 1978) was born in Ukraine and studied at the Odessa drawing school. In 1903, he moved to Paris and took French citizenship. He continued his education at the French National School of Fine Arts (1910s), in the sculpture workshop of A. Mercier. 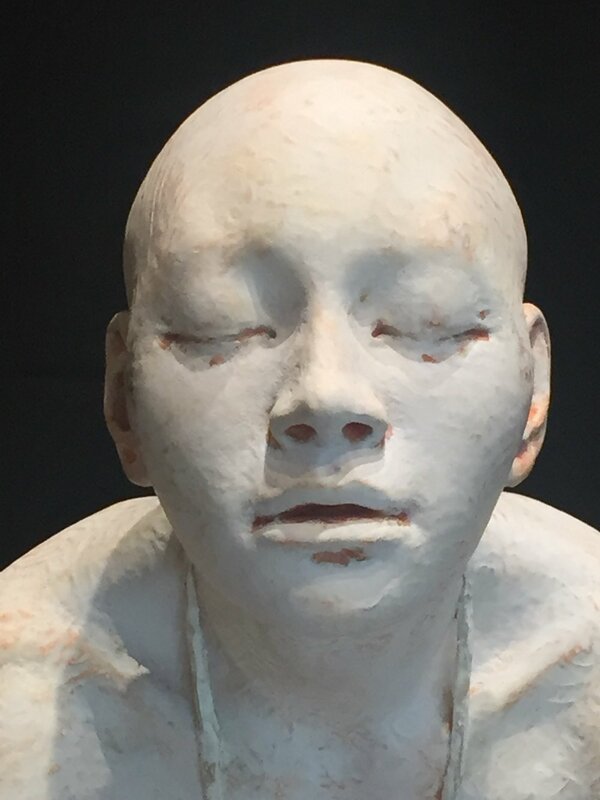 Young artist worked in the field of easel and monumental sculpture: creating heads, figures, genre scenes, as well as animalistic sculptures of wood, terracotta, bronze and marble. 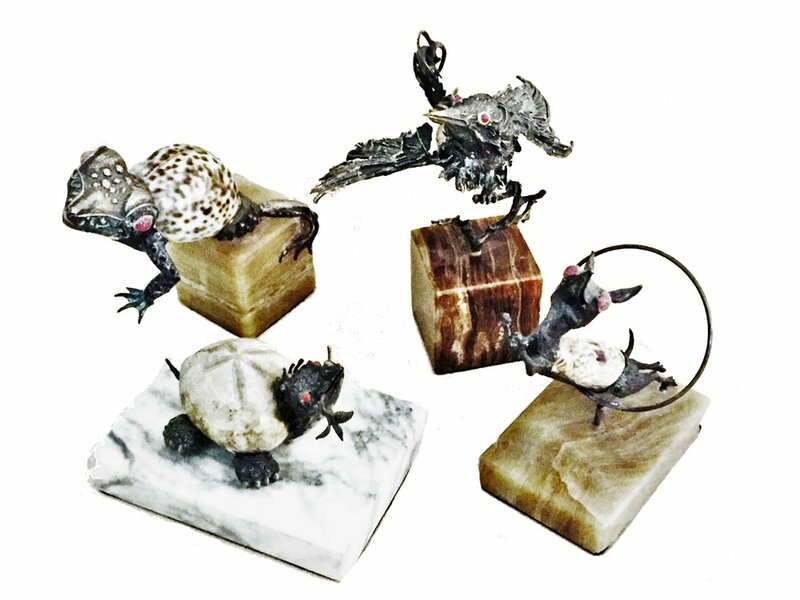 In his works, he adhered to strict classical forms; from time to time resorting to styling his creations in the spirit of Oriental plastics and the grotesque. 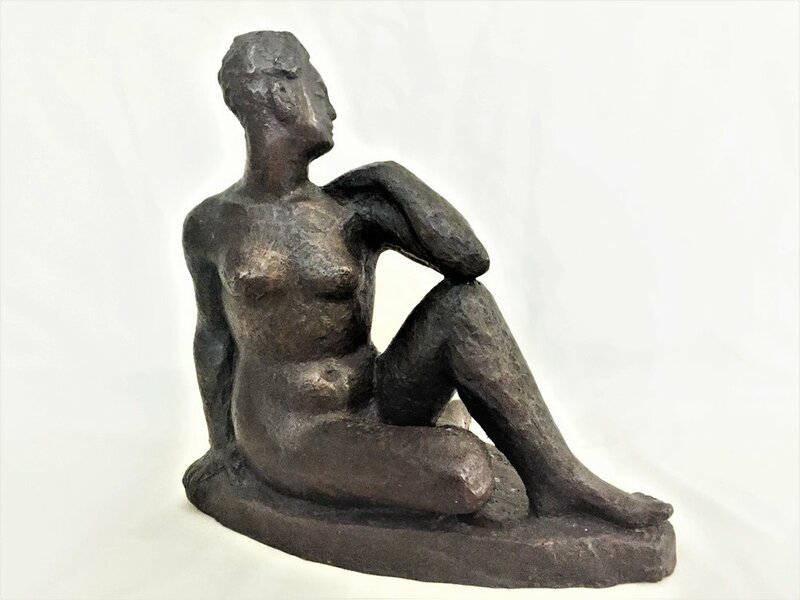 Loutchansky regularly exhibited in the Paris Salons - Independent (from 1907), Tuileries (from 1923), Autumn (from 1936); and participated in exhibitions - Russian art in London (1921), the International Society of Sculptors, Painters and Engravers in London (1921, 1922), the group "Numbers" at the "LʻEpoque" gallery in Paris (1931). In 1928, four works ("My Shopkeeper", "Man's Head", "Head of a Young Girl" - 2 versions) were presented in the Russian section of the "Contemporary French Art" exhibition in Moscow. Jacques Loutchansky taught in his own workshop; among his students were M. Kellery, E. Frankel (Rothschild), E. Bernkopf and other renown artists. In 1931-1932, he lived in New York City and arranged a number of solo exhibitions in his workshop. In June 1938, Loutchansky held a retrospective exhibition in Paris’ Pierre Gallery. 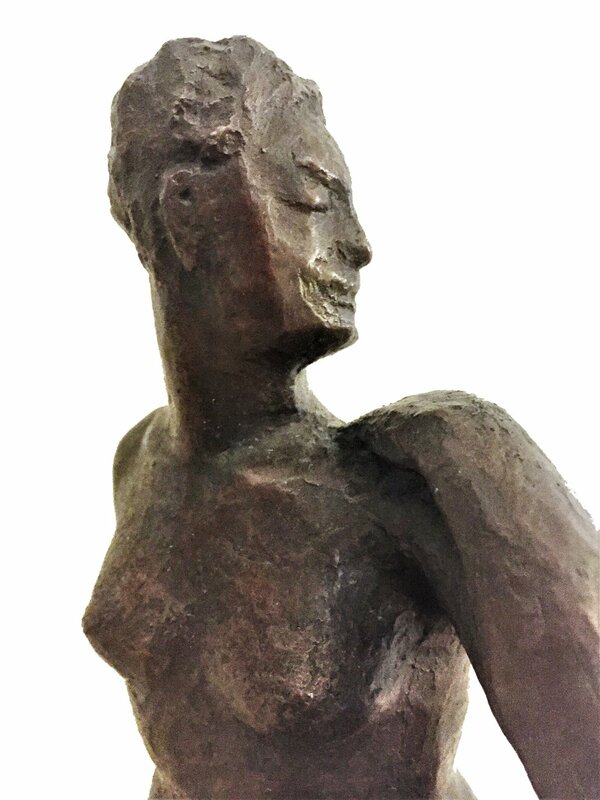 In 1945 and 1947, the sculptor’s works were featured at the exhibitions, organized by the France-USSR Committee of the 14th District of Paris. In 1949, he settled in Givat Brenner Kibbutz, Israel; and created a series of Israeli public figures portraits, such as Z. Shahar, B. Katsnelson, T. Herzl and others. Among the artist’s outstanding works of that period, there is an allegorical relief, ‘The Symphony of Life’, 1959. Jacques Loutchansky was the winner of the Dizengoff Prize for sculpture and painting (1976). In 1976, in honor of the artist’s 100th birthday anniversary, a retrospective exhibition was held in Jerusalem; and a commemorative album ‘Sculptures by J. Loutchansky’ was published by Givat-Brenner, with foreword by the leading art historians, E. Kolb and J. Kass. Jacques Loutchansky works are in many museum collections around the world - in Paris, Basel, Bremen, Jerusalem, Tel Aviv, and Moscow. Jacques Loutchansky (French, 1876 – 1978) was born in Ukraine and studied at the Odessa drawing school. In 1903, he moved to Paris and took French citizenship. He continued his education at the French National School of Fine Arts (1910s), in the sculpture workshop of A. Mercier. 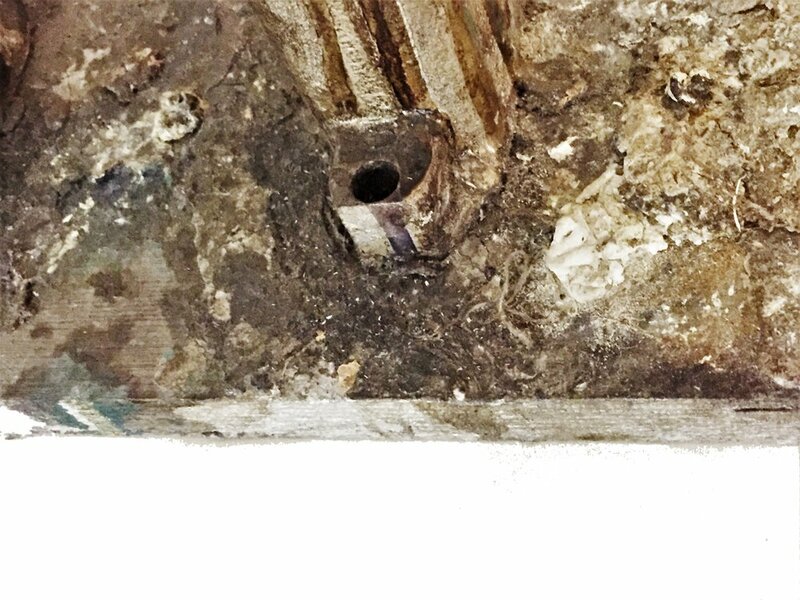 Materials: Duralumin aircraft parts, recycled wood, paint. MAGALI a/k/a Levan Magalashvili (b. 1953) is a renowned artist from the Republic of Georgia, widely known in Europe for his revolutionary Avant-Garde paintings & sculpture. His works are in many international private modern art collections; as well as included in Sotheby’s contemporary art sales. 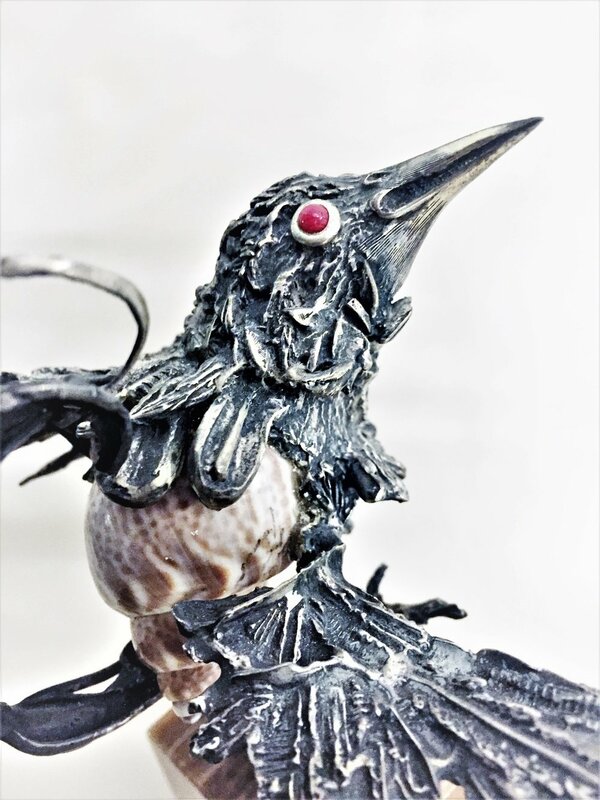 Materials: Ultracal, plaster, pigments, gold, white gold leaf. Chie Shimizu was born in Japan in 1971. She earned her BFA in metal crafts from Tokyo University of the Arts in 1993 and her MFA in sculpture from New York Academy of Art in 2001. She has had several shows of both metal works and oil paintings in Tokyo and Kanagawa, Japan. 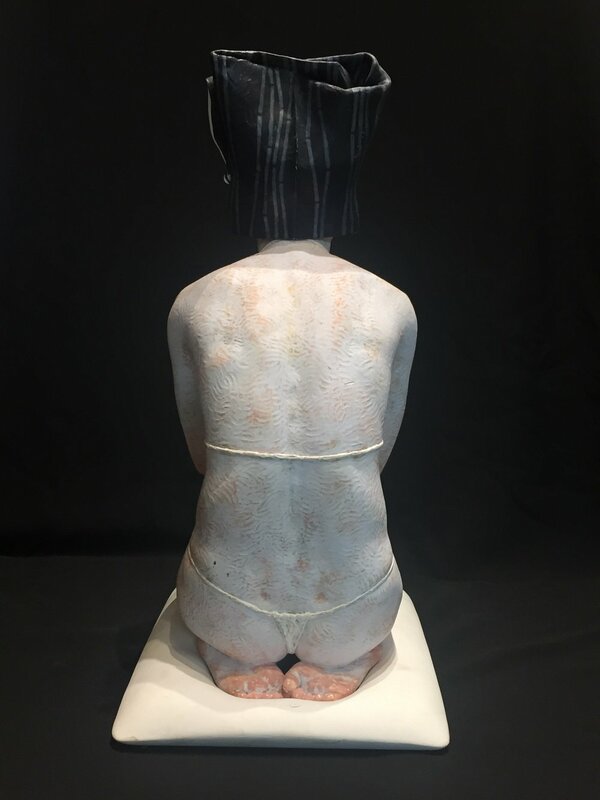 Her work has been exhibited in numerous venues in New York, including Island Weiss Gallery, Mark Miller Gallery, Dillon Gallery, Booth Gallery and Fresh Window Gallery. 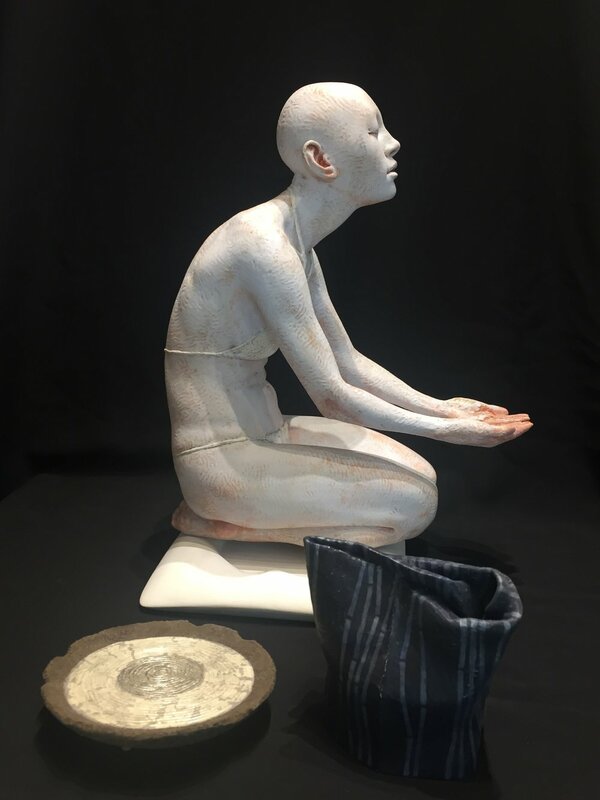 Shimizu’s work has also been included in private collections worldwide, from the United States to Germany, Turkey, Israel, Peru and Japan. She currently lives and works in Queens, New York. Signed & 2012-Copyrighted on the bottom. Alexander Ney (Russian, born in 1939 in Leningrad, Russia) is an American sculptor and painter. He immigrated to the United States in 1974 and has since lived and worked in New York City. Developing several individualistic styles in modern art, he is most famous for his unique work in terracotta sculpture, involving heavily perforated surfaces and intriguing forms. We make our best effort to provide a fair and descriptive condition report. Please examine the photos attentively. Send us a message to request more details or discuss price. Benson A. Selzer (1921 - 1999) was an American artist, known for sculpture and painting. Signed with initials: “PH” or “Pt”, and dated: ’74. In 1971, he entered an international competition for a statue to be placed on the Aswon Dam. To the embarrassment of both Egypt & USSR, Neizvestny, a Jewish sculptor, won. Despite honors and privileges bestowed on him by the Soviet Government, Neizvestny preferred to have freedom to work openly on the themes of his choice. In 1976, he was finally allowed to leave the country. Now in the United States, he continues to devote much of his creative effort to Jewish history. 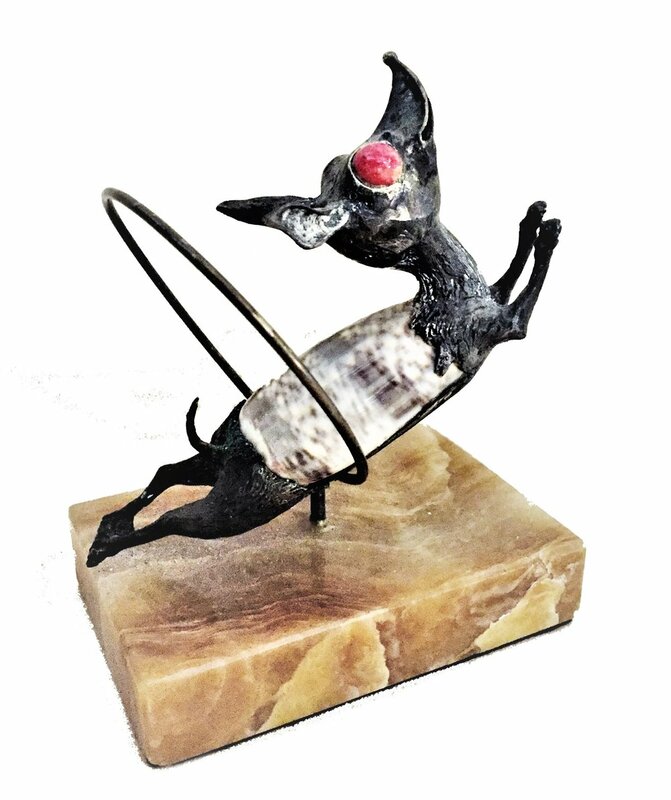 This is most unusual and one of a kind work of art from the sculpture garden of the Estate of Ron Street, ex-employee of the Metropolitan Museum of Art, and husband of Carmen Bambach, Curator of Drawings at the Metropolitan Museum of Art. Ron was a brilliant and valuable senior 3D imaging manager at the Museum for 30 years, and was an important figure in bringing the Met into the 21st century with computer imaging and 3D analysis, working closely with various departments in achieving their goals of educating the public and expanding the visual comprehension of the works of art on display. In his personal life, Ronald Street was a sculptor and painter, and for the landscape inside and around his country home in Walton, New York, Ron created one of a kind bronzes, marble and stone works of art, wood sculptures and folk art creations, for family and friends.To the best of our knowledge, all these works are one of a kind, and were never offered for sale..
Feron left Costa Rica for New York City in 1945, and he became an American citizen in 1951. In the United States he designed and created sacred vessels, jewelry, and sculpture for private clients as well as for the firms Rubel, Van Cleef and Arpels, Verdura, Schlumberger, Bronzini, Cartier, David Web, Tiffany & Company and Steuben Glass Works. His work has been accepted in the collections of Musee d’Art Moderne, Paris, Museum of Fine Arts, Boston; Currier Museum of Art, Manchester, NH; the Virginia Museum, Richmond, VA; and the Cathedral of Detroit, MI. Feron married the dancer Leslie Snow in 1962 and established a workshop in New Hampshire. In 1977, he was awarded an honorary Doctor of Humane letter by Plymouth State College. In 1995, thirty-five of his pieces formed an exhibit at the Musée des Arts Décoratifs in Paris. Feron taught a number of prominent artists over the years, many of whom maintain their own workshops and carry on his traditions, including Pierre Etienne Lahaussois and Carvin French. JEAN COHEN (1927 - 2013) was a New York-born American artist, known for painting, sculpting and teaching. Signed and dated on the base: Ellen Brenner ‘92. Marked: 4/8 - for Limited Edition. Elegant in its simplicity, this bust depicts the head of a beautiful young woman with her hair spread out over her shoulders and her eyes closed. Original dark-brown patina, signed illegibly in Japanese hieroglyphs. 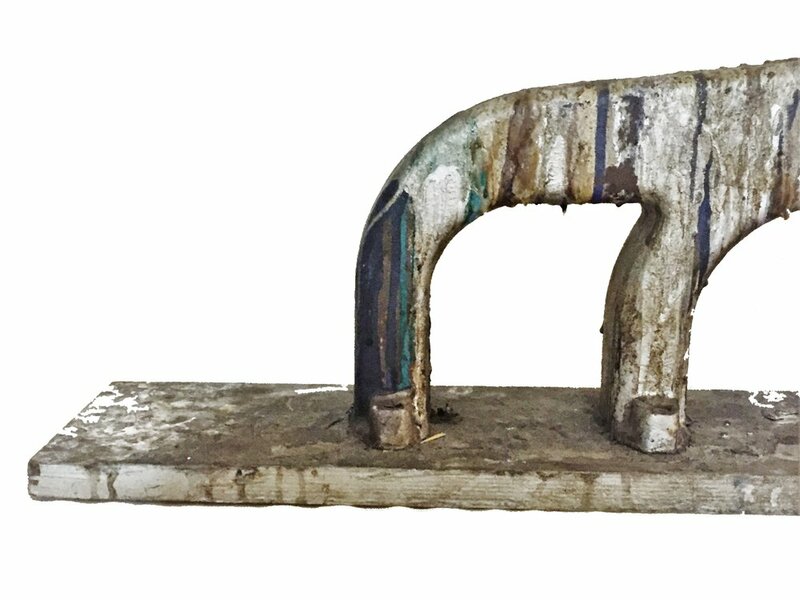 This very unusual minimalistic, but extremely expressive, desk-size sculpture is unsigned, and has an original marble base. 1900 Birth in Baku of Sébastien Tamari (Russian Empire). 1920 He left his hometown due to political events. He traveled through the Caucasus, went to Constantinople and then to Palestine. In 1922, He enrolled at the School of Fine Arts in Jerusalem. He arrived in Paris in 1924. Then he studied in 1926-1928 with Jean Boucher's sculpture course at the School of Fine Arts. From 1928 he is also part of architecture over the Decorative Arts, it will follow until 1932. 1931 Marries his wife Lyuba. 1935 First exhibition (Salon des Cent). 1937 Exhibits at the Zak gallery. 1941-1944 He was introduced to woodworking in a furniture factory in Clermont-Ferrand and is dedicated to animal subjects. 1945 He participates in the first Montparnasse Salon where he exhibited a relief, the Chamois. It has 1946 stone and bronze at the Tuileries living room and the gallery Bernier. 1947 He exhibits a carved wooden Deportees and the Round the Society of Independent Artists, where he will show his works regularly until 1972. 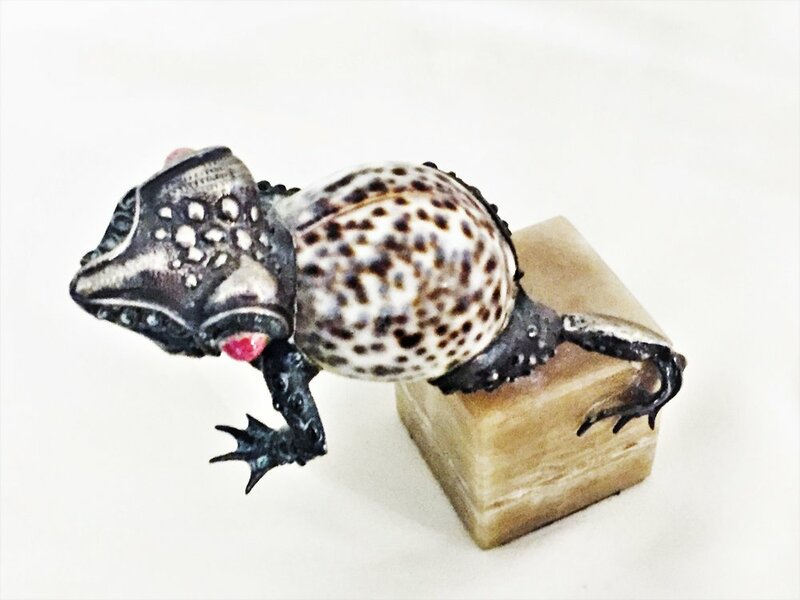 Until the retirement age, Sebastian Tamari worked for Valsuani foundry, located not far from his studio. He was introduced to the patina of which he became a skilled specialist. 1954 He discovered the magic of the assemblies, the first will be a portrait of a man. 1955 First solo exhibition at the gallery Breteau where he collects some success. 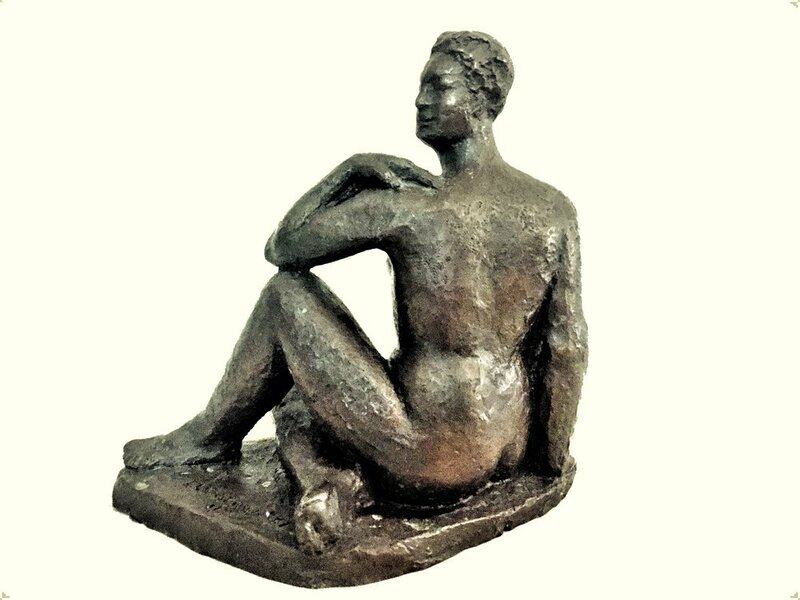 Woman bronze jug was bought by the French state and deposited in 1956 in the town of Junies (Lot). Located on the town hall square, the statue was spirited away during the summer of 1995. 1961 It shows Don Quixote I at the Salon de la Jeune sculpture, in which he participated in 1958 and presents various works at the gallery of the University. 1963 Another group exhibition called in Zurich, during which a film will be shot by Swiss television. Don Quixote I is again exposed to the Rural Exhibition organized in the gardens of the American Artists's Center. On this occasion, his work is noticed and will be the subject of a solo exhibition in New York at the World House Galleries, who will present him with the siren for the Carnegie Prize (Pittsburg) in 1964. 1964 He participates in the exhibition Forms Human Rodin Museum and presents the Water Carrier. It shows the Spanish in 1965 in which comparisons are held at Fair Museum of Modern Art of the City of Paris. 1967 He participates in the Salon d'Automne. 1968 He received the Silver Medal of the Société d'Encouragement au Progrès at the closing of the International Festival of painting and visual art graphico-Saint-Germain-des-Prés. 1969 He participates in a group exhibition at the Swedish Club in Paris. 1970 He presents motherhood for which he received the André prize of Switzerland. 1971 He graduated from the International Exhibition of Paris and exhibited at the Rimon gallery. 1974 He participates in the International Exhibition of Paris-Sud (Juvisy) where he obtained an honorable mention diploma in 1974. He presents Don Quixote 1977 II in Montrouge Contemporary Art Show. In 1979, he was appointed an associate in the Salon d'Automne. 1981 and 1985 to particpe The International Exhibition of Small Bronze. 1982-1989 He shows his works at the Salon of the XIV arrondissement. In 1982, Medal of the City of Paris, silver grade. 1988 Bronze Animal exhibition Medal of the City of Paris, silver grade. 1988 Bronze Animal exhibition at Nevers. This wonderful work of art came from the collection of painting, sculpture and jewelry by Xavier Gonzalez and his artist wife, Ethel Edwards, that was given to the Arts Students League of New York by the Gonzalez family after Xavier’s passing. Both, Xavier Gonzalez and Ethel Edwards were at one time teachers at the Art Students League. 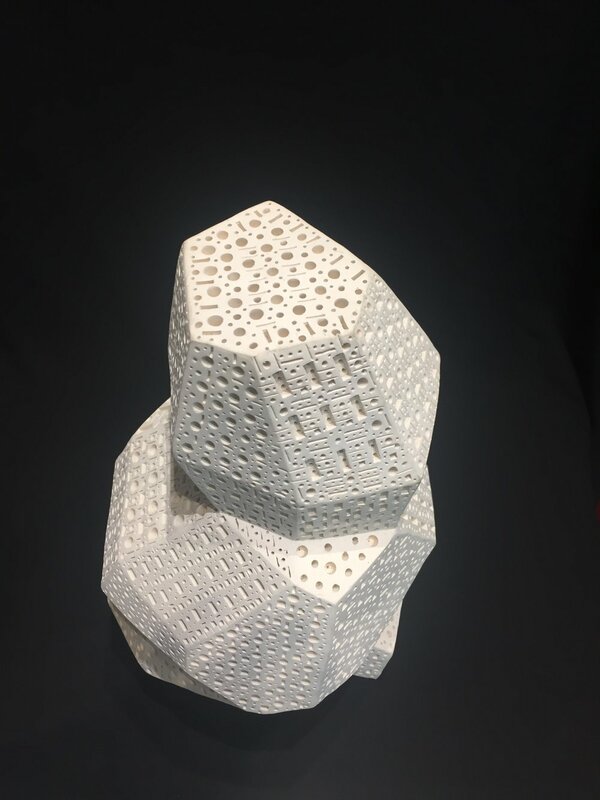 The sale of this object directly benefited the Xavier Gonzalez Memorial Fund in raising funds for future students’ scholarships. This work has been in storage for a number of years, and prior to that, in the personal collection of the Xavier Gonzalez and Ethel Edwards family. Xavier Gonzalez (Spanish/American, 1898 – 1993) was an American artist, born in Almeria, Spain. He lived in Argentina and Mexico for some time, and was planning to become an engineer in a gold mine. However, in 1925, he immigrated to the United States and began his studies at the Art Institute of Chicago from 1921 to 1923. His uncle, José Arpa studied with him there. Gonzalez also studied at the San Carlos Academy in Mexico City, as well as in Paris and in the Far East. In 1931, he became a US citizen, and in 1935 married fellow artist Ethel Edwards (1915–1999), who was seventeen years his junior and his student at Newcomb College. Gonzalez often worked and studied with fellow artist Julius Woeltz, who was the best man at his wedding. Best known for his mural painting and sculpture, Gonzales commandeered the canteen wall at Newcomb for the use of his art students. His works have been displayed throughout the United States - at the Corcoran Gallery of Art, the Whitney Museum of American Art, the Metropolitan Museum of Art, just to name a few. Gonzalez was also well-known in Paris, Venice, Brussels and Tokyo. He taught art at Tulane University, the Brooklyn Museum, Case Western Reserve University, and the Newcomb Memorial School of Art, and was the director of the art school at Sul Ross State Teachers College in Alpine, Texas. In 1953, he was elected to the National Academy of Design as an Associate member, and then became a full Academician in 1955. He illustrated a children's book called "He Who Saw Everything. The Epic of Gilgamesh" by Anita Feagles (1966). Xavier Gonzalez died of leukemia in 1993, at the age of 94, in New York City. His wife, Ethel Edwards painted 2 murals; one titled Life on the Lake in 1942 at the Lake Providence, Louisiana post office and the other, titled Afternoon on a Texas Ranch, completed in 1941 at the Lampasas, Texas post office. 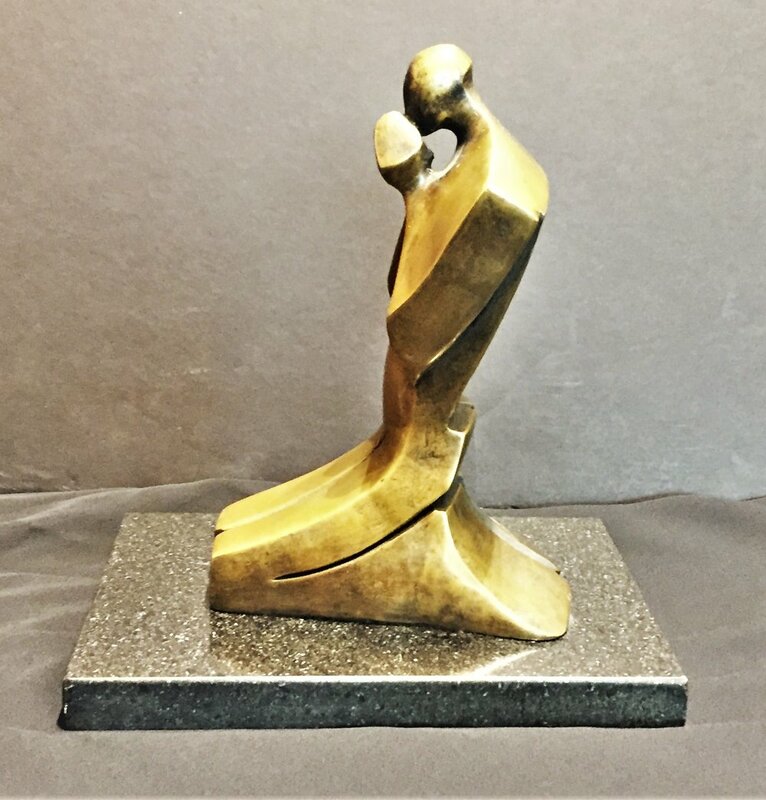 Unusual streamlined modern depiction of a praying kneeled man in polished bronze. 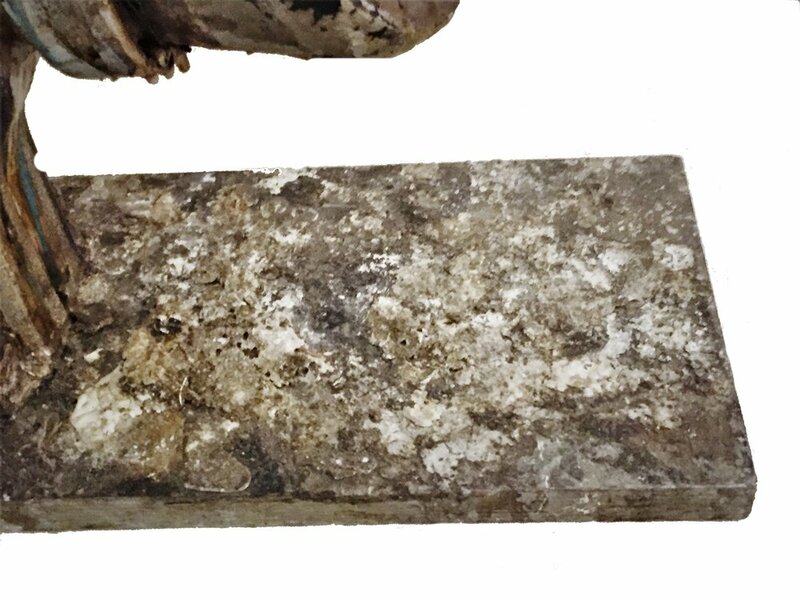 Original marble base. Very heavy. Unsigned. 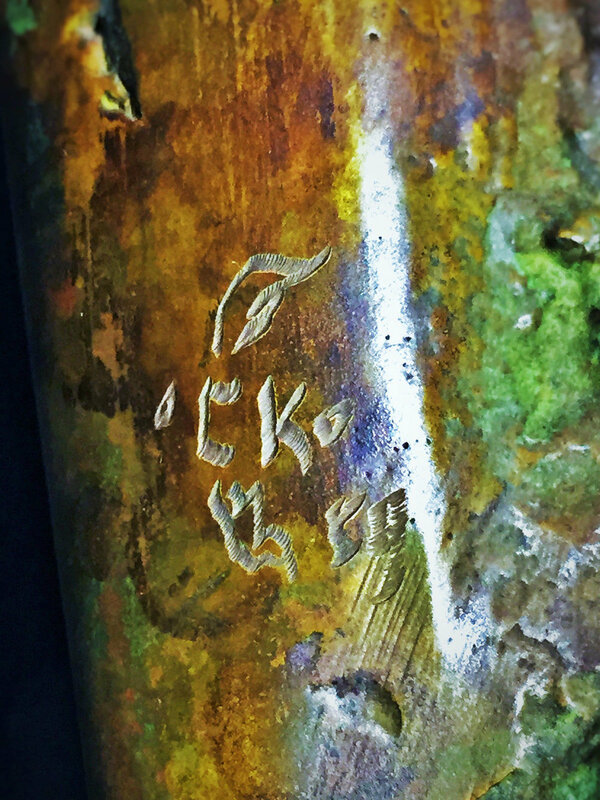 Signed en verso by the artist’s facsimile: ‘Lipchitz’, and his fingerprint. 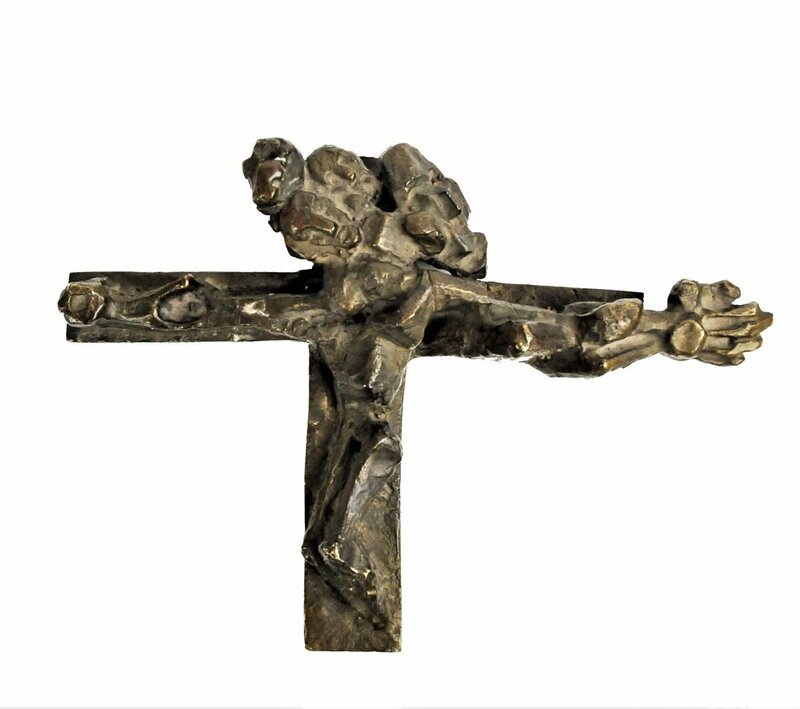 JACQUES LIPCHITZ (French, 1891 - 1973) Lithuanian and Jewish, the refugee artist Jacques Lipchitz arrived in Paris at precisely the right time: when the early-20th-century European avant-garde was shaking up the art world and Cubism was born. When we think of Cubist sculpture, the works of Lipchitz emerge as exemplars of the style translated into three dimensions. Later, the second time Lipchitz fled for his life at the beginning of WWII, he left behind a less abstract style and, in a major career-changing transformation, began producing larger-scale sculptures in bronze. Later still, the work of the ever-dynamic Lipchitz had become increasingly emotionally expressive, often incorporating themes from Judaism. 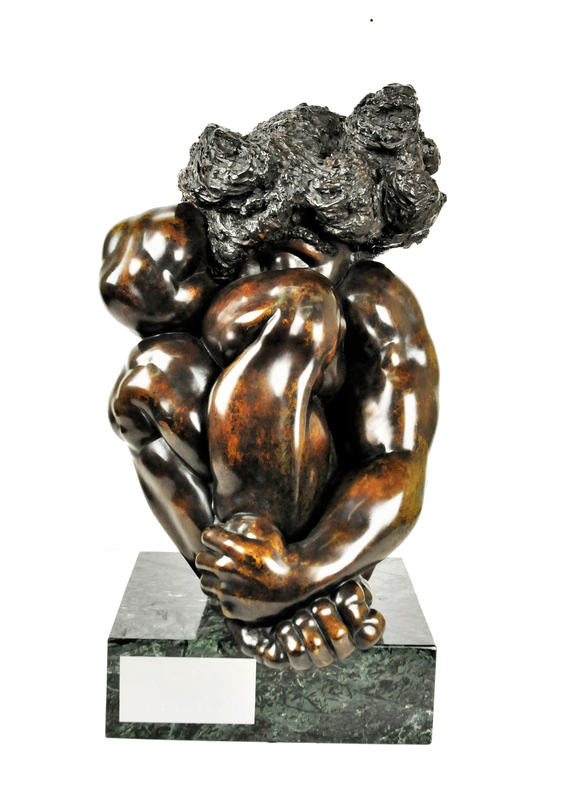 At the end of his long lifetime and multinational trek, Lipchitz may be regarded as one of the foremost contributors to the Cubist style and to modern sculpture. A unique abstract sculptural composition in anodized iron. Signed on the base T. Truitt, and dated 1974. Good condition, wear consistent with age and use. We make our best effort to provide a fair and descriptive condition report. Please examine the photos attentively, as they are an integral part of the item description. 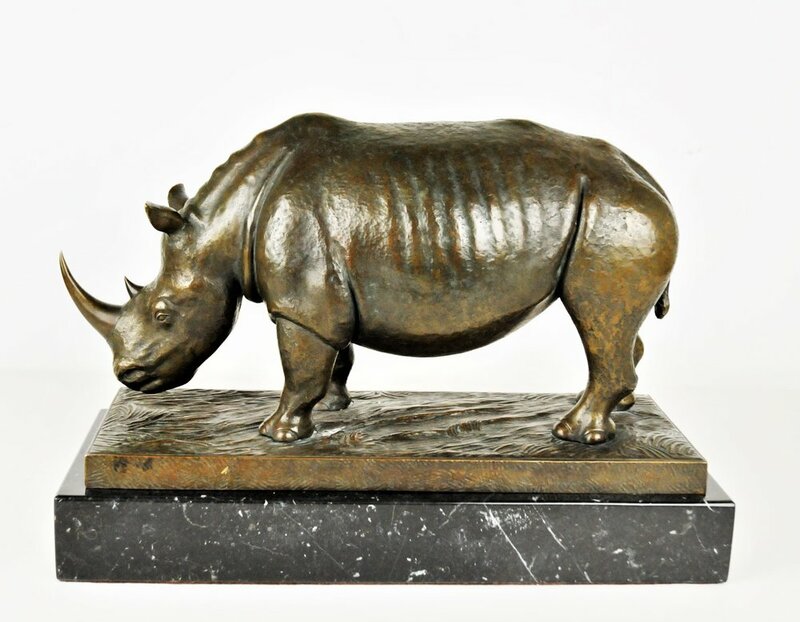 Bronze sculpture of very fine quality casting, with light verdigris-type patina. Inscribed twice: Javier Marin - on equestrian’s left shoulder and on horse's right rump. Javier Marin (Mexican, b.1962), a world-famous Mexican artist was born in 1962 in Uruapan, Michoacán. He got his education through Academy of San Carlos and the National Autonomous University of Mexico. During his 30-year career, he had 270 exhibitions in Canada, Mexico, the United States and a few of South American countries. Most of his exhibitions were held in Mexico City’s museums, such as Museum of Modern Art and National Print Museum; and also the US museums, such as Museum of Fine Arts, Boston and the Santa Barbara Museum of Art. In 2008, he was awarded with the Prize of the Third International Beijing Biennial in Beijing, China. Javier Marín’s artworks demonstrate remarkable knowledge of the human form garnered from years of drawing directly from the figure. 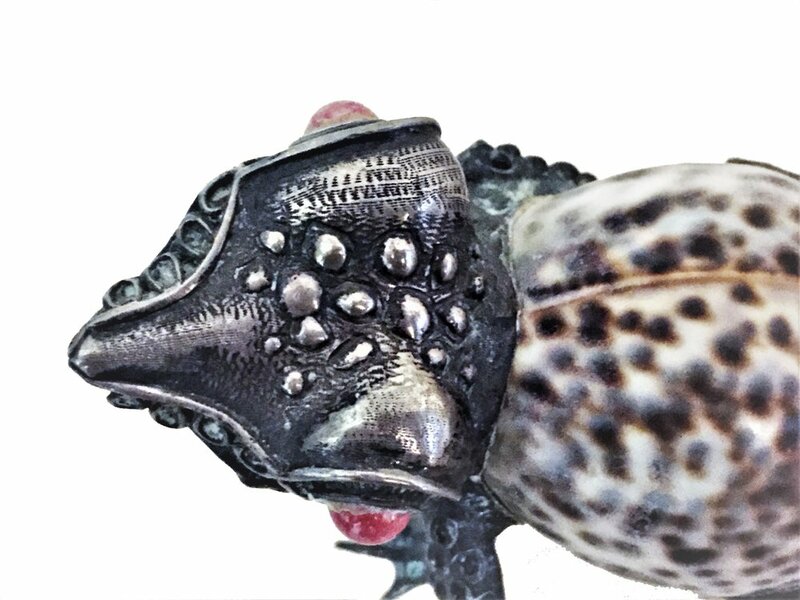 Process is an obvious passion for Marín: spikes of bronze are often left exposed to show the paths of molten metal flowing into the cast figure. It is this deliberate coarseness combined with Marín’s elegant classical approach to the figure that give his sculptures such power and substance. He captures the mystery of Michelangelo, the drama of Rodinl, and the extraordinary dignity of Mayan and Aztec portraiture. The massive bronze nudes of Javier Marín offer a unique blend of Western European and Mexican perspectives while embracing the vitality of Renaissance sculpture. The sculpture is signed and dated on the front right wheel: "FIORDA" & "8" (for 1998). Plaster and resin, signed by the artist and dated 1958. 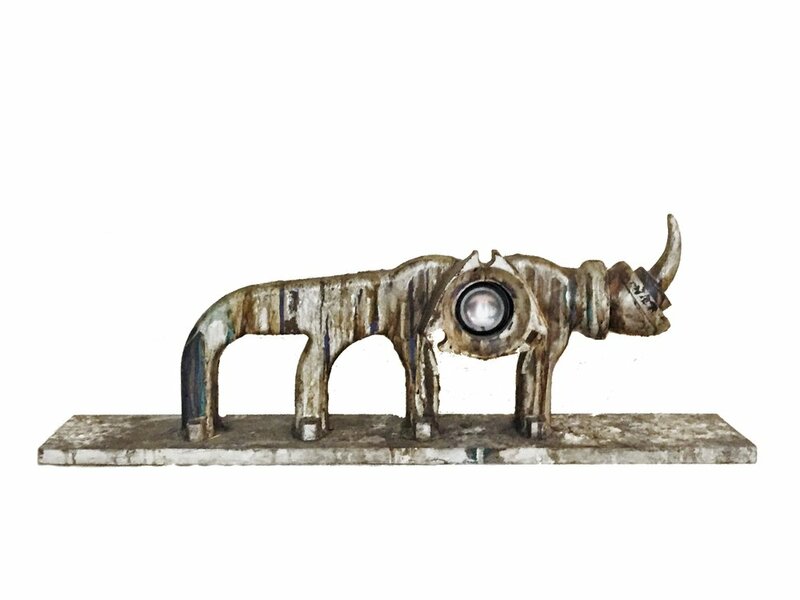 Although Charles P. Lamb enjoyed a successful career as a furniture designer, he created a personal oeuvre of metal sculptures, paintings, jewelry and wood carvings while working in a barn in Livingston Manor, New York. The impressive works of art were unknown to anyone except Lamb’s immediate family until an estate property auction was held to benefit Doctors Without Borders, which became a day of an important discovery for knowledgeable dealers and collectors. The artist was born in Iowa, served in World War II and was educated at Stanford University. While there he studied engineering and gained a degree in English and Theater Arts. Mr. Lamb went on to become an actor and then manager of the Dobbs Ferry Players. When the theater group folded, Mr. Lamb turned to making custom designed furniture. His clients included jazz great Stan Getz and many other important musicians, entertainers and socialites. As a sculptor and fine artist, Charles Lamb was untrained. Yet at some point he acquired a barn in Livingston Manor, NY and turned it into a metal-working studio, where he systematically improved on the rudiments of welding, metal casting [including lost wax bronze], and other technical/creative skill sets he had acquired as a young adult. Working in solitude, he passionately produced the works of art that are becoming famous now.. In the 1970s, Mr. Lamb - an outsider artist retired from the making of custom furniture. 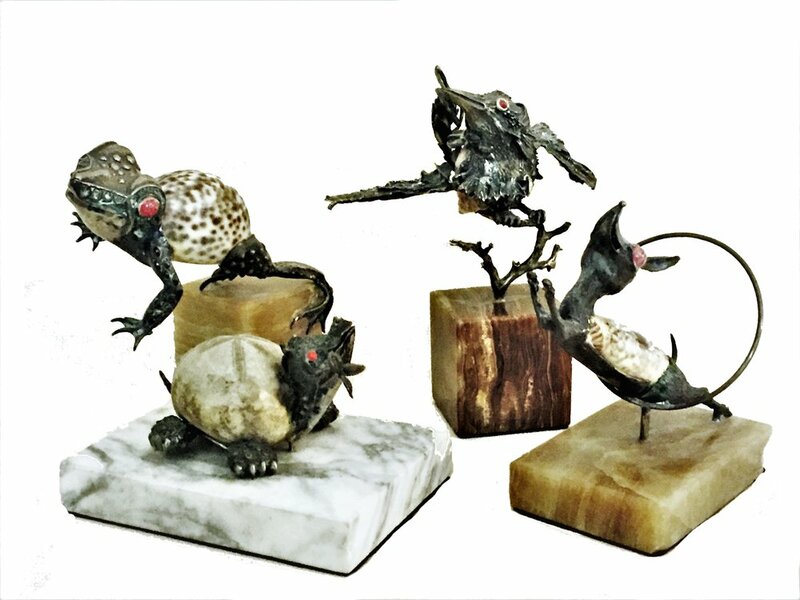 He turned full-time to the pursuit of his personal art endeavors, referring to his need to create as “My Curse.” For decades, Charles Lamb surrounded himself with the beauty he created. 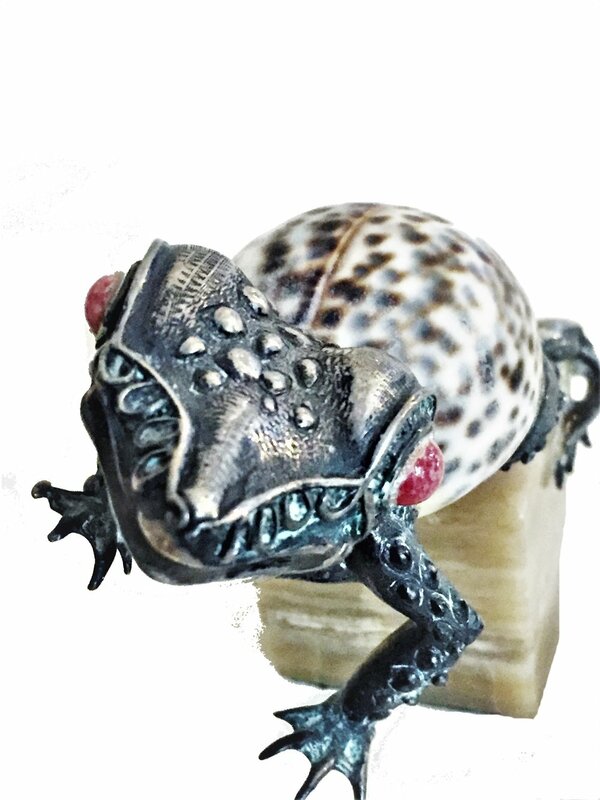 He worked in welded steel, bronze, and carved wood. He produced monumental figurative works, the sources of his inspiration are wildly divergent and based on his studies into multiple civilizations, cultures, and mythologies across time and space. His works are informed by nature, antiquities and history. In some pieces there are literal references morphing into stylized motifs that can only have sprung from the imagination. Bernard Langlais (American, 1921-1977) was a sculptor and painter in Cushing, Maine. Langlais, a French-Canadian and Indian native of Maine, attended the Corcoran School of Art, moved to New York, and became a close friend of many of the rising New York artists. Tired of the New York competitive art scene, he returned to Maine, abandoned abstract painting, and achieved considerable success with monumental wooden and outdoor sculpture. 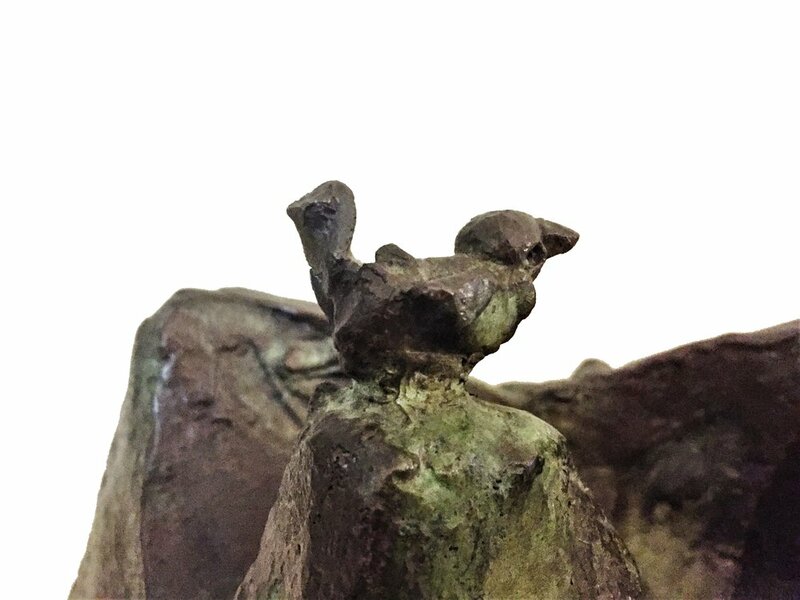 Full of mystic significance and symbolism, this most unusual bronze sculpture is signed illegibly, the authorship is not established. 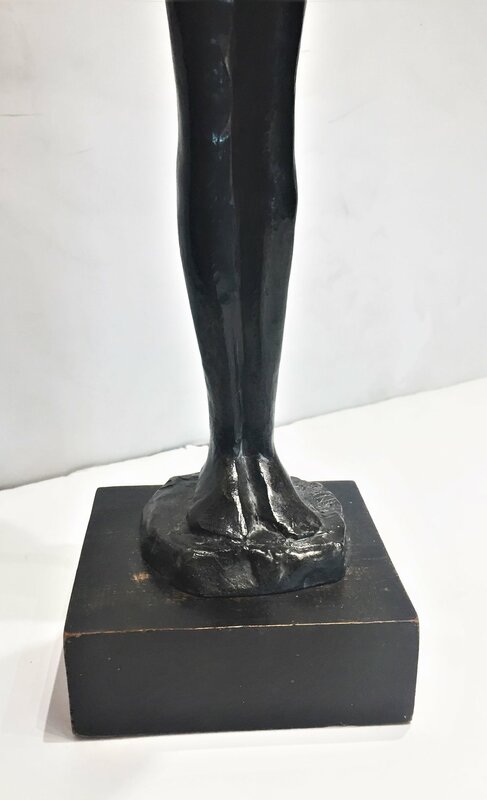 A beautifully carved modernist wood sculpture by well known and highly collectible New York artist, Chaim Gross (1904-1991). It is one of ten small versions of a 29" sculpture in the collection of the Metropolitan Museum of Art. Signed CH.GROSS on the plinth with the artist's "fox stamp" below, and on the bottom of the base, as well. Provenance: Schrick private collection, Connecticut, USA. In excellent vintage condition with original patina. Chaim Gross (American, 1904 - 1991) Chaim Gross was an Austrian born American sculptor. He was born in the then Austro-Hungarian village of Kolomyia (since 1991, in the Ukraine) and immigrated to the United States in 1921. His art studies began at the Kunstgewerbe Schule in Vienna shortly before he moved to the United States, where it continued at the Beaux-Arts Institute of Design where he studied with Elie Nadelman and at the Art Students League of New York, with Robert Laurent. Gross began exhibiting both his sculpture and graphic art in 1935, and was one of 250 sculptors who exhibited in the 3rd Sculpture International held at the Philadelphia Museum of Art in the summer of 1949. Primarily Gross was a practitioner of the direct carving method, with the majority of his work being carved from wood. Works by Chaim Gross can be found in major museums and private collections throughout the United States. Gross was a professor of printmaking and sculpture at both the Educational Alliance and the New School for Social Research in New York City, as well as a member of Artists Equity, the Federation of Modern Painters and Sculptors, and the National Institute of Arts and Letters. He served as President of the Sculptors Guild of America. This unusual sculpture is a bright example of the American figurative arts in the 1970's - 80's. A powerful sculptural depiction of a human praying to God.